This is a GUEST POST by Fazreen Razeek. The views in this article are not representative of the views of BusinessBecause. In recent years, the Middle East has established itself as a rising hub for MBA education. A number of schools now boast accreditation from the Association to Advance Collegiate Schools of Business (AACSB), the Association of MBAs (AMBA), or EFMD Quality Improvement System (EQUIS). Then, there’s the external influence. Many international business schools offer MBA and executive MBA (EMBA) programs in the Middle East, contributing to a knowledge exchange between the region and the West. Babson College is set to offer a part-time, blended MBA program in the Middle East, which combines online classes and virtual collaboration with face-to-face sessions in Dubai. Courses will be delivered by Babson faculty, and the school waives the GMAT for qualifying candidates of the Babson MBA in Dubai. If you’re a business owner, or belong to a family of entrepreneurs, and want to advance your career, this EQUIS-accredited MBA program is perfect for you. The American University in Cairo is the only triple-accredited business school in the region. The university is also the only internationally-accredited business school in Egypt which offers both an MBA program and an executive MBA program. If you’re looking for the business acumen required to address the region’s most pressing challenges and to seize the opportunities in today’s ever-changing, local, regional, and global business environment, this is the MBA for you. Dubai Business School gained its AACSB accreditation in 2009. It offers evening classes with a total course duration of 15 months. The school also offers a number of MBA specializations, including an MBA in Leadership and Human Resources Management, and an MBA in International Business and Marketing. Specialized MBA students have 21 months to complete their degree, while the General MBA degree can be completed in as little as 12 months. 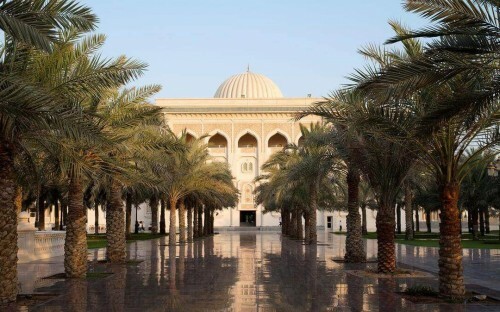 The American University of Sharjah is one of four business schools accredited by AACSB in the United Arab Emirates. Graduates are equipped with the skills they need to launch management and leadership careers in both the private and public sectors, and individual participation is emphasized through class discussions, case study methodology, and interaction and cooperation with other students in the class. Based in Al Ain, the United Arab Emirates University is also accredited by the AACSB. During four semesters, students are prepared for business leadership positions beyond the UAE. Elective courses also offer students the chance to immerse themselves in today’s rapidly changing technological environment. Options include Business Intelligence & BPM, E-Business: Technology, Strategies & Applications, and Enterprise IS. The Leon Recanati Graduate School of Business Administration International MBA program is the only accredited business school in Israel. The program is delivered in Hebrew and is offered to executives with an undergraduate degree and at least seven years of managerial experience. In Saudi Arabia, the King Fahd University is the only university accredited by the AACSB. Incidentally, the College of Industrial Management was the first college in the Middle East to receive AACSB accreditation. The MBA program can be completed in full-or-part-time format, and places students at the heart of graduate management education in the Kingdom. The American University of Beirut’s Suliman S. Olayan School of Business gained AACSB accreditation in 2009 and offers an MBA program that can be completed in 14 months. The MBA program in AUB is an immersive experience in business education, which helps students build a strong knowledge base and gain individualized skills which can be useful in the future. The university is the only one in Qatar to have its MBA program accredited by AACSB. The MBA curriculum prides itself on preparing students to analyze the implications of ethically and socially responsible decisions, a key mantra for any MBA in the modern day. It also aims to help students integrate IT-based procedures into their business strategy, and to approach and tackle global issues when making business decisions. Kuwait University offers an MBA program specifically for working professionals in Kuwait. It is also AACSB accredited and represents the flagship program of Kuwait University’s College of Business Administration. It integrates the latest smart technology into the curriculum and equips graduates with the skills necessary to thrive in today’s technologically-demanding marketplace. Fazreen Razeek from Edarabia.com has served the education industry for over five years. He collaborates and works alongside education-marketing agencies, event organizers, and educational Institutions ranging from nurseries, schools, and universities to develop and execute their marketing strategies. A graduate with High Distinction from the Edith Cowan University, Perth, Australia, Fazreen holds a Bachelor’s Degree with a double major in Marketing & Management.